This is a favorite chicken salad around here. I think the hint of lemon makes it. I originally posted this on my other blog awhile ago, so it is aptly named after our Blueberry Cottage, which is still what we affectionately call our little farmette. Mix all of the above in a bowl (save some nuts and cranberries for the top) and present on a bed of greens. I used some iceburg on the bottom and mixed herb salad on top of that. Sprinkle a few extra nuts and berries on top and voila! My husband had his on whole wheat bread that I make and he loved it this way. So , whatever suits your fancy. You could also pack this for a school lunch with a cool pack to keep the salad chilled. Totally yummy, I promise! This looks fabulous! I think some added blueberries might be nice. I may try it this week! I found your blog when I googled ladies quilting and found a picture, started clicking, and voila, ended up here! 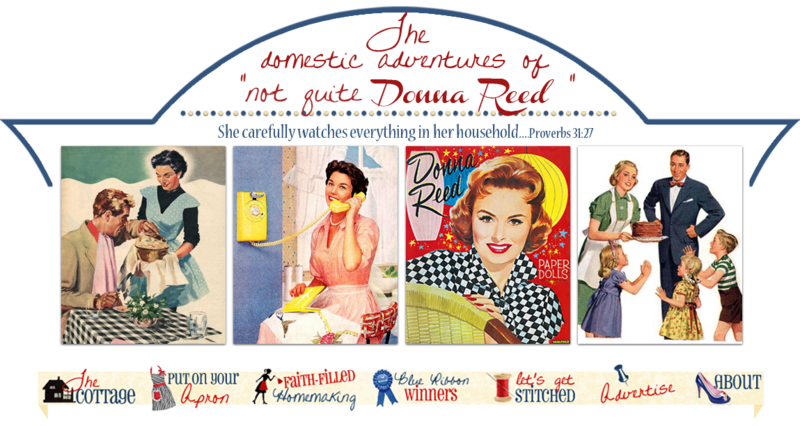 The name Donna Reed caught my eye because she was my idol as a girl growing up in the 50's and 60's. I thought she was the perfect housewife and could see myself being her! I plan to become a new follower and hope you'll drop by my blog for a visit. I'm a Grandmama of 5 who has a passion for quilting. FYI: You may want to consider turning off the word ID and more people will stop to comment. I had a freind give me that advice a year ago and I had no idea Word ID was even on my blog. I get much more traffic now that it's off plus those of us with aging eyes have a terrible time seeing those letters. I often give up and go to another blog. Im a new follower, - Im enjoying looking around your blog, its lovely! Yum! I am making chicken salad tomorrow and I shall try this one out! :) Such a sweet blog. After researching recipes (I went through a lot of them) I made this for Hubby's lunches this week. I omitted the grapes and added just a smidge of minced onion. I used Duke's mayo. To shred the chicken, I tried the nifty little trick of putting them in my Kitchen Aid mixer bowl while hot and using the paddle on medium speed to shred. Works wonderfully!